"When I was a boy there was no such thing as therapy. I was alienated and always within myself. I was not a normal kid spiritually." 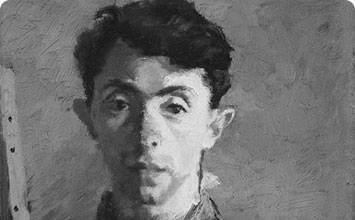 Drawing on his own immigrant experience, Raphael Soyer sensitively portrayed a vast swath of working-class and homeless men and women during the Great Depression and in the decades following World War II. Affiliated with both the Fourteenth Street School and the Social Realists, Soyer's presentation of the plight of the urban population resisted overt politic statements and instead probed the psychological toll of growing consumer capitalism. An ardent opponent of abstraction, which during the 1940s and 1950s was ascendant, Soyer insisted on a humanistic realism in order to communicate with his viewers. Soyer, along with artists such as Reginald Marsh and Isabelle Bishop, kept alive and expanded the tradition of figurative painting. Their urban subjects and their sympathetic depictions have received new scholarly attention and can be related to the international reprise of figurative painting after World War II. Soyer's subjects - unemployed men in breadlines, homeless men waiting for shelter and assistance, the New Women of the workforce - made up the fabric of the urban environment of New York City. In portraying the downtrodden and the underdogs, Soyer wanted to give voice to the overlooked and unseen to elicit recognition and empathy from the viewer. Instead of political painting that exposed the structural deficiencies of American urban society like some other Social Realists, Soyer opted to show the more personal and individual costs of such a society, and his work was unique in its psychological explorations. 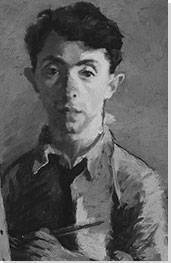 While working from models hired from the streets, Soyer managed to create intimate portraits of specific people, but people who remained nameless and not recognizable to the public and so the portraits become depictions of anyone and everyone to whom viewers can more easily relate and find commonalities. In rejecting the trends toward abstraction, Soyer looked to the French Realism of Gustave Courbet and Edgar Degas. Closer to home, Thomas Eakins and the Ashcan School painters inspired Soyer's realism. Often employing looser brushstrokes and relying on color instead of line, Soyer's realistic depictions also emphasize the materiality of the paint, thus undercutting idealized and romantic attitudes toward his subjects. Raphael Soyer and his twin, Moses, were born in 1899, near the central Russian town Borisoglebsk. His father, Abraham, was a scholar and teacher of Hebrew and the intellectual leader of the family's small Jewish community. His mother, Bella, was an embroiderer. The couple raised the boys in an atmosphere of intellectual inquiry and encouraged their sons to sketch and paint at home, hanging works by Russian artists around the house as decoration. Abraham's liberal ideas and popularity among students, however, led to trouble with the Russian provincial authorities, and the family, being Jewish and needing permission to reside in the town, was denied their Russian residence permit; they were thus forced to emigrate to the United States in 1912, where they moved to Philadelphia before settling in the Bronx, New York, a year later. Interactive chart with Raphael Soyer's main influences, and the people and ideas that the artist influenced in turn.